Start your spring season off right and provide your lawn and landscape the best opportunity to look beautiful. Neglecting your lawn during April and early May can be hazardous to your lawns summer and fall health. It all starts with a spring cleanup once the weather breaks. Most lawns create a layer of thatch and if the snow was heavy, you may be have a thicker layer of thatch, sticks and residue from the late fall. 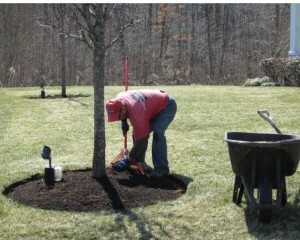 Our team will rake your lawn removing a layer of thatch and sticks and remove most of the winter debris. If it was a particularly heavy winter, there may be an additional charge to tackle tree removal, broken tree branches and some heavy lifting outside of the scope of this offer. Early spring is the best time to repair damage caused by snow plows and snow blowers. You will find most of this damage around driveways and the lawn close to the paved areas. Our team will prepare the soil for sod and overseeding. Growing new grass successfully is time sensitive. If you plant grass too late, the new grass roots will be stressed by the warm dry summer weather. Adding pre-emergent in April is a must if you want to control the weeds before they have a chance to take root. Waiting to apply the pre-emergent granules until May will reduce its effectiveness and add to your manual weeding later in the season. If you have perennials that bloom in the late Spring, they will need the room to grow and spread and if weeds are in the way, they may get choked. The next step in the process is to apply a nice layer of shredded mulch to help control weeds and improve the quality of your soil. 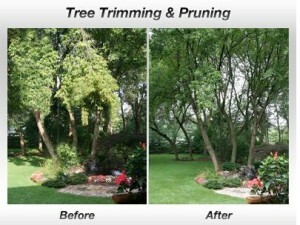 Early spring is a great time to do some heavy pruning of your ornamental trees and shrubs. It is best to address this in the fall but if you did not get a chance, your team at Alpine Gardens has all the tools and experience to do this task for you. Timing is critical and the natural blooming cycle of some trees may be disrupted but the overall health of your trees and shrubs will be greatly improved with a properly pruned garden. Let us know in the comments what you do to care for your gardens and lawn in the spring time. This entry was posted in Lawn Care on April 1, 2014 by Scott. Hi guys, can you tell me what seed will germinate the fastest. We have a section of lawn that was ruined due to work we had done in the fall. We’d like to fix it as quickly as possible as we’re having a party for our son at the house this spring and its a bit unsightly. Thanks for your help! Hi James, annual and perennial ryegrass will germinate the fastest, about 7-10 days. Its a cool season grass to plant early in properly cultivated soil and add some starter fertilizer to speed up root development. Cover bare soil with a layer of straw. Water everyday to keep soil moist. Use a blend of seed though, not just ryegrasses. Fesue, bluegrass and others will not germinate as fast but will come in when the seed is ready giving a healthier thicker lawn.